After an extensive two-day screening held at The Crew Room in Makati City last April 14 and 15, Royale Chimes Concerts and Events Inc., organizers of Mr. and Ms. BPO 2017, finally revealed its 28 official candidates for this year's BPO Queen. BPO Queen is the first nationwide pageant for gay and transsexual members from the Business Process Outsourcing (BPO) industry. The pageant aims to empower the gays and trans workforce by giving them a platform to express their thoughts and views on inclusion, diversity and equality. It is also a celebration of their unique beauty, wit and talent. 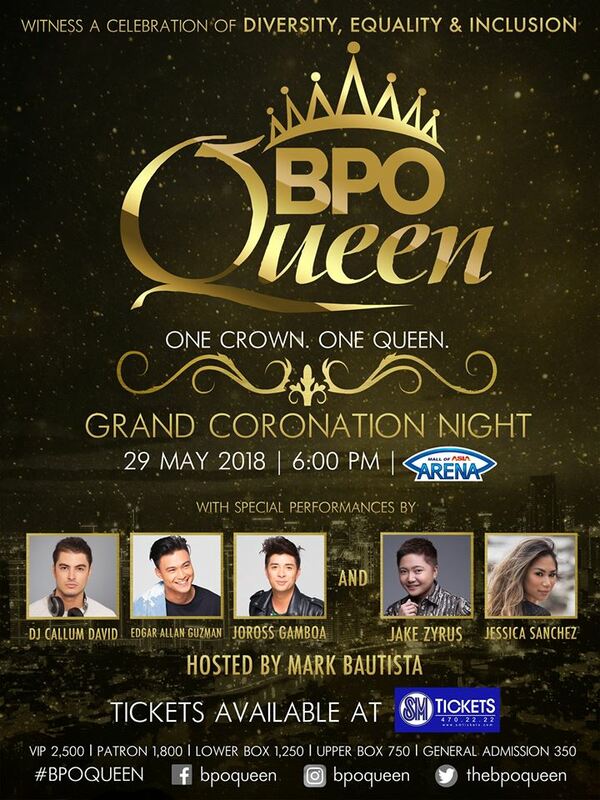 The BPO Queen Grand Coronation is on May 29, 6:00 PM at the Mall of Asia Arena with special performances of international recording artists Jessica Sanchez and Jake Zyrus, actors Joross Gamboa and Edgar Allan Guzman and DJ Callum David. Hosted by singer-actor Mark Bautista. Tickets are available at SM Tickets with the following ticket prices: VIP 2,500; Patron 1,800; Lower Box 1,250; Upper Box 750 and General Admission 350.